Dear Fellow Yogis and Yoginis! The first of the month is also known as April Fool's Day, one of those "holidays" that has not been very commercialized, unless you consider the increased sales of whoopee cushions! No matter how you feel about it, it surely is a special day for pranksters of all ages who have the ability to turn our frowns upside down. I wanted to play a practical joke of some kind for this month's newsletter. I considered making a big announcement about quitting yoga and going to work for a tobacco company, or post a new study that found yoga to be harmful to our health! While I enjoy a goofy gag, a jesting joke, and even a playful prank, I sense that our world has certainly changed in the last few years. Especially in light of the many ‘doom and gloom’ newscasts around us, people generally seem to have forgotten to laugh with others or at themselves. Laughter can convey meaning more effectively than words and is a special language in itself. It can heal and help us connect as a community. And I am not about to give up what the Muppets refer to as the world’s 3rd greatest gift –laughter--just yet! I know you are with me on this one! I therefore propose the month of April be a month where all of us nurture our playful and sometimes silly inner child. 1) SMILE MORE. Start you morning with a smile and repeat frequently through the day, specially when you make eye contact with another person. 2) LAUGH MORE, or find more things to laugh about. Scientifc Research shows us there are health benefits to laughter. Believe it! 3) SHARE A FUNNY OR LIFE AFFIRMING QUOTE OR STORY, specially with someone having a rough day. 4) PLAY an appropriate, emphatically-minded, and harmless "joke" on someone you love. Make sure to have plenty of connecting time afterwards. Click here to read an article about how to apply humor in your life. 5) BE SILLY and PLAYFUL. Devote some time to play with your loved ones, or your pet(s). Just in case you get too carried away with the laughter and fun, please be assured that there is an FDA-approved "cure" for your happy condition called DESPONDEX! Click here to get your laughs! Taiwan’s Living Room Yoga, my childhood Light Bright set, and YOU! For me, yoga is as much about alignment of the body as it is about the energy we connect within ourselves and within the community in which we practice. I have been a part of the San Francisco Naked Men’s Yoga community since 2006. It all started during the time I was enrolled in Darren Main’s yoga teacher training program, and Darren invited me to take his Sunday evening class. One thing led to another (when do they not?) and shortly after graduating from the training program, I stepped in to cover for Darren. It was a daunting experience and I still can recall how nervous I was. (The proverbial technique for overcoming stage fright: “just try to imagine everyone in the group as naked” didn’t work so well in this case.) I can also recall that the class was incredibly welcoming and supportive. Many of the students had been practicing yoga much longer than I, yet they treated me with such generosity of spirit, offering kind words of encouragement and enlightening feedback that I could integrate into my future teaching. This is one of many instances where I felt the power of our community of naked yogis to lift one another up and celebrate one another’s paths. Eventually as the community grew, I had the honor of stepping up to start a second class in the middle of the week. Fast forward almost 7 years later to a community that now has 3 locations, 9 classes, 6 regular teachers and it seems that we still have some exciting growing to do. While we don’t have solid stats on how many people have attended our classes over the years, we have 600 readers of our monthly newsletter, and I would guesstimate that our community is well over 2,000 men. 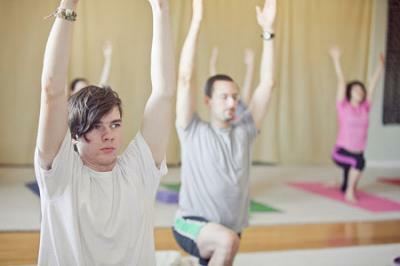 Being part of this community of ‘brogis’ is one of the most rewarding parts of being a yoga instructor. I am just returning from a trip to Asia where I got to participate in a beautiful yoga community’s holiday gathering in Taipei. I was so touched to be invited to speak about the Naked Yoga for Men movement here in the Bay Area and to witness the yoga community growing in Taiwan as well. Getting to step into another community in another country was a refreshing RESET for my mind/body/spirit. While there were language barriers and cultural differences, I was also enlivened by the warm welcome I received from the group of Taiwanese gay men bravely working to create a safe space for them to practice yoga. The group started with one teacher and two students in a living room. It has grown to over 50 students and four classes in the past two years. These dedicated teachers are making history in establishing the first gay men’s yoga sangha in Taiwan. While the sangha of men does not practice naked yoga, we explored the differences and similarities of our two groups, especially around the theme of empowerment through our yoga practice. I can imagine there are many places in the world where it is still not completely safe for like-minded (or open minded) men to gather and practice yoga together, with or without clothes. I acknowledge that not all men that come to the NYM SF classes self-identify as gay or queer, moreover, each of us come to the class to explore different parts of who we are. In fact, my hope is that our group continues to evolve in a way that allows for even more straight and trans-men to join us. And I have not given up on the vision of having an all-inclusive (all genders welcome) class. In any given class, whether I am student or teacher, I can look across the room of naked yogis and not know a thing about what each person does outside of the room in their personal and professional lives. I can only stand with each of them and be in awe of their courage, strength and dignity when each man rolls out his mat, sheds his clothing and settles into his practice. And for me, that is where the joy of being part of this community lies. I have shared this story in class a few times about one of my favorite toys growing up. This story is about me as an 8 year old and my cherished Light Bright toy. You know, the one with the triangular plastic case, a simple light bulb in the back, a black cover with numerous holes, and a box of colorful pegs. I don’t even think it had an ON/OFF switch; rather when I plugged it in, it was ON, when I unplugged it, it was OFF. This toy was pretty basic and downright dangerous if you left the light bulb on too long. Well, I would spend hours taking different colored pegs, plugging them in and seeing the various pictures and designs I could create. If I came up with something I favored, I would use it as a night light for a while. It was exactly what a shy 8 year old growing up ½ mile from his closest friends needed during cold and dark Pennsylvania winter nights: a toy that kept him entertained as well as feeling safe and warm, even when he was all alone. I was reminded of this long forgotten toy from my distant past one day when I became emotional standing in front of a room full of naked yogis, which appeared as a room full of unique lights all shining brightly. This random gathering of men just happened. Or perhaps there is nothing random about it at all. I could only stand and admire the room of men who were sweating, breathing and practicing this ancient art of connecting to one’s own Truth. How blessed I felt to be here with my brothers in a safe and supportive space to let go of who the world thinks we ‘should be’ and relax into who we truly are. I felt just as safe as I did as when I was 8, but I also had the comfort of no longer being alone. To each of you who is part of this community, and to those that are part of other gatherings, thank you all for holding space for each other. Your breath, your practice, your intention are all changing the world for the better. And as our communities in Taiwan, in San Francisco, or in any corner of the world grow, we have more opportunities to shine our own light and be inspired by the light of others. Thank you GQ (the yoga teacher who dreamed and manifested the gay men’s yoga group in Taipei) and the others at Living Room Yoga for all that you do for your yoga community in Taiwan. I look forward to practicing with you again! Bank of America has taught me so much about my yoga practice. Here are the ten practical and spiritual lessonsI have learned. One of the earliest tales in yoga mythology is about the warrior Arjuna heading into battle while consulting with Krishna about the moral dilemma of engaging in a brutal war with his fellow humans. As it turns out Krishna encourages him to follow his Dharma or his ‘duty’, which in his case, was to wholeheartedly step into the battle so that he can restore balance and justice. In this modern era of global conflicts that are not quite as easy to understand as the ancient battle described in the yoga texts, there are still some comparisons that can be drawn. Everything from poverty, to corporate and political injustices, to basic human and civil rights seem to be more and more intense these days. While it may feel better to turn off the news (and I highly recommend that as a practice from time to time), we can no longer simply go back to sleep and pretend that we are not living at a very critical time in our collective history. Ever since the Occupy Oakland camp in front of City Hall was disbanded (or raided or imploded, depending on how one looks at it) in December 2011, I have not been able to teach yoga on the streets to the Occupiers and the commuters in that area so I reapplied my energies to daily life including my social work jobs, yoga classes, and yoga therapy workshops. For the past few months, I actually felt that things were going fairly smoothly and on some level I did allow myself to ‘go back to sleep,’ forgetting the bigger societal woes that many face -- that is until one fateful day in February when I received TWO separate and contradictory letters from the exact same representative at Bank of America. I was then abruptly shaken out of my slumber and I am wide awake now! And much like Arjuna, I am called back into a battle that I would prefer not to deal with but it seems this is my Dharma or my ‘duty’ to see it through. I want to explore how my current ‘battle against Bank of America’, my campaign to save my home from foreclosure, holds some key practical and spiritual lessons for me. In mid-February, I received both a foreclosure notice and a ‘congrats on your trial loan modification’ letter from the same person at BoA. While the legal experts I have consulted with say that this is legally acceptable practice, even they agree that it is a more costly procedure for the banks. And a more stressful and confusing process for their customers. Now if my relationship with BoA were a relationship between two people – not a preposterous idea considering the Supreme Court’s recent ruling in Citizens United – how would that look? If I were in a relationship with someone (i.e. landlord, parent, friend) who was letting me live in their home and they came up to me and slapped me across the face and said, “I am going to kick you out sometime soon. Not sure when, but be ready to be kicked out!” and then in the next moment they gave me a huge hug and said, “I know how hard you have been working to pay me for your room, so I am going to give you a chance to stay. I won’t give you any specifics, but just keep paying me and we will see how it goes.” And should I inquire about any specifics or which scenario is more likely (getting kicked out or getting to stay), the reply causes me even more confusion and distress because I can’t get a clear answer. What type of relationship would this be? I would say I am in a pretty messed up dysfunctional one for sure. So, how do I stay engaged, and not loose my cool or my mind? Over the past few weeks I have come up with 10 key practical and spiritual lessons I am learning through this experience. In moving through this process, I remind myself over and over that there are some things I have control over (i.e. my breathing, my attitude, and if I decide to walk away from this ‘battle’) and some things that I have no control over (i.e. the bank losing my documents, the outcome of the loan modification decision). The Serenity Prayer definitely brings clarity to an otherwise perplexing situation and allows me to channel my energies into the things I can change and let go of those that I can’t. Ok, so even if there is a lot of top management wrongdoing going on, whenever I get on the phone with a front line representative, I do try to cultivate as much compassion and lovingkindness for the person on the other end. I have learned that some of the phone representatives barely make $15/hour and so far as I can tell, none of them have a Union backing their jobs. In this fading empire, people are struggling to make ends meet so I feel for those who have to deal with stressed out, disgruntled customers with little training or backing from their employer. I even got one of the representatives to be a little bit choked up about her work situation and another to disclose her own housing woes. I TRULY hope there is healing going on in these bank-customer conversations. Let’s get one thing clear: I would like very much to remain in my downtown Oakland home and live in a wonderful community that is such a crucial part of my overall wellbeing. I am going to take very good care of myself and stay on top of what I need to do to keep my home from being taken away by the banks. And those that know me do know that I am very well equipped for a social or economic justice battle. Bring it on, BoA! I am very aware at how the “worrying mind” will take on this situation and gnaw away at it endlessly. Sleep and eating habits have been impacted. Now is the time to make sure that my morning and evening practice is not interrupted. Now is the time to keep my mind-body in its optimal health so I can deal with the increased amount of stress this ongoing dilemma has brought my way. I am learning all over again how to turn off the computer, to limit the amount of news articles on the banks I read every day, and how to keep the positive and healthy things in my life (i.e. relationships, exercise and mediation routines) from falling by the way side. The best way I have found is to schedule in brief periods of time when I focus solely on the ‘battle with the bank’ and other longer times when I do not talk or read about the banks at all. According to Wikipedia, “Maya is a Sanskrit term that has multiple meanings, usually quoted as "illusion", centered on the fact that we do not experience the environment itself but rather a projection of it, created by us. Eastern philosophy understood what Keanu Reaves was dealing with long before there were special effects to make the Matrix seem so scary, foreboding and triply. I remind myself every day that the world is a reflection of my internal experiences. According to some, Maya is merely ‘the structural integrity of one’s ego” and it keeps us from waking up to what is real. The way I see it, if I am distraught and preoccupied by a call I received from the bank a day ago, what beautiful things in life I may miss out on all together. The vibrant spring blossoms, the reassuring hug of my partner and the innocent laughter of children are there whether I notice them or not. It’s up to me to acknowledge my relationship to the world around me and how my attitude will be a filter in how I experience it. Now that I have a better understanding of what it takes to deal with a financial institution, I know I am not about to do the Don Quixote method and tilt at windmills alone. I now have on my team my State Assemblyperson, a powerful nonprofit that helps people deal with the banks, and a legal consultant. It’s a shame that so much energy has to be put into something that has become so complex and so unmanageable that no one person could possibly do it alone. Nonetheless, I have met many very well intended professionals who have their hearts in their work and put fairness and economic justice first. A beautiful reminder that there is goodness in all people and we must come together if we really want to see the world change. I realize that there is a good chance that within the next 6 months, I will have to walk away from the home that I love so much. My hope is that through networking, speaking up for justice and sharing my experience that some others may also benefit. I have shared with many people via Facebook and in person standing in front of a bank, handing out copies of the Rolling Stone article, and I hopethat people will not go back to sleep and will find for themselves a way to ‘pay it forward’, creating a positive ripple effect in our society. If we continue to live in a society where money is first and everything else including health and community are a distant second, then even after my housing situation is resolved, I know that I will still continue to put time and energy into helping improve our society. I tell myself over and over again that I must practice not being attached to my home or the outcome of this battle. I also know that a certain amount of passion and energy comes from having something worth fighting for. So many of the invaluable lessons mentioned above help me practice staying engaged but also staying emotionally neutral with how it all turns out. As with so much of my yoga practice and my personal development, I am a work in progress. I hope that whenever you are faced with a stressful situation, you will come up with your own list of grounding lessons or mantras that help you through to the other side. All of the wisdom of yoga is ready and waiting for you. And it doesn't have to cost you a thing! Just as each of our life journeys are unique, the obstacles you face in your life may be quite different from what I have described above. The yoga mat may be where you first find a moment of clarity or connection to your True Self and a break from the chattering of the monkey mind. Stepping off the mat and facing the everyday joys and stressors is really where the practice takes off. I woke up one morning to realize, I am living on "borrowed time"....Now what? Last month, I had two reminders of how precious and brief life truly is. First, on February 8th, I had the distinguished honor of sitting with my neighbor during his final hours of life. He was 30 years old. His wife had supported him through many years of chronic illness and multiple medical complications that eventually took its toll on his physical body. His mom and his wife were at his side when he passed away that evening. It seemed that they were already prepared to say their good byes as he had been in hospice care for the past few weeks as his body surrendered to the inevitable final transition. Tears were shed, laughter was heartfelt, prayers and hugs were part of the late night evening when other family and church members arrived to celebrate how this man touched each of their lives. A week later, on the morning of Valentine’s Day, I awoke with the sweet remembrance of my mother who passed away from a short battle with pancreatic cancer exactly 20 years ago. I reminisced about how my humble and compassionate mother managed to selflessly raise my brother and me as well as act as the surrogate parent for many youth in our neighborhood. She was the go-to person when someone needed a baby sitter; she often stepped in to offer minor veterinarian care for those that could not afford to take their pet to the vet. She worked a minimum wage job to help her younger son through college, something her parents were not able to do for her. My mother was 42 when she passed away. According to one way of thinking, I will, therefore, be living on ‘borrowed time’ when I turn 42 in August of this year. The minister’s message touches my heart. I realize that every day, every breath is a gift and that my yoga practice is about staying present with this awareness. I dedicate my service as a social worker and as a yoga therapist to my mother’s spirit, I also continue to deepen my understanding of what it means not to take anything for granted. As I find gratitude and balance in my life, I honor that my yoga practice on the mat is a metaphor for a constant need to recalibrate with the constant changes that occur How can I push myself to my physical limits while remaining in my open heart of compassion and lovingkindness? How do I balance my thinking mind with my feeling heart? How can I discern what pose to stay in and when to rest? When do I take in the wisdom of the teacher leading a class and when do I let my inner teacher lead my practice? How do I celebrate my body without getting attached to how it looks or how it feels in any given moment? How do I surrender into my final resting pose and stay fully aware of my relaxed state without falling asleep? Lately the wisdom of the Muppets continues to remind me of the simple yet profound way I learn how to be present in each vulnerable moment of my vulnerable life. The other day, I was listening to my Muppet’s station on Pandora and this sweet little song came on. It’s Kermit’s nephew Robin singing a poem by A.A. Milne (of Winnie-the-Pooh fame). I actually remember watching this episode back in the 1970s and experiencing such an intense sense of vulnerability for this little Muppet creature who sits and quietly sings a song from his heart. "I hope no one comes down those stairs and accidentally steps on him," I thought to myself. I am dedicated to keeping the most important things in life as simple as possible. I thank those that have demonstrated what it means to live life fully and die with dignity. I am grateful for the lessons my mother taught me as a child and the lessons my recently departed neighbor taught me during the brief time I got to reside near him. Likewise, I dedicate my yoga class teachings to be an opportunity for each of us to dwell in mindfulness, to be grateful for each breath and smile. The practice of yoga can be an opportunity to remember our best selves, our true selves, and to make ourselves open to the new eternal present moment. I know who, and I am certain you do, too! Take a Leap of Faith with me! I have always found it very peculiar that every four years we get an extra day in February, but to be honest, until today I never really took a leap into exploring why that is the case. EXCEPT the last year of each century, such as 1900, which is NOT a leap year . . . EXCEPT the year 4000 and its later multiples (8000, 12000, etc.) which are NOT leap years. – and just go back to my comfort zone of pondering the existential opportunity this EXTRA day offers, all the while breathing a sigh of relief to know that not finding a clear-cut answer is THE answer. WHEW! The life of one day is enough to rejoice. if this day in the lifetime of a hundred years is lost, will you ever touch it with your hands again? This is where I ask myself, what does being totally awake and present mean to me right now? In the finite number of years I have to live, what do I want to do with my time? How could exercising an even more mindful approach to life enhance my quality of life? And as a yoga therapist, how can I support others in doing the same? I guess this extra day in February could come in handy after all. Just as 2012 is our Leap Year, the last day of this short month is our Leap Day. And that is what I think we all should do! Take action. Do something. Move forward. Be proactive. Jump out of a rut. And LEAP towards our true potential. Most importantly, be present with who you are and where you are RIGHT HERE, RIGHT NOW! So, if you are already enjoying each and every moment you know what it means to live life to the fullest. Then you also already get what it means to have an entire EXTRA day (24 hours or 86,400 seconds) to experience life in such a magical way. But,for those of us still asking ourselves: “So what is so precious about an entire extra day every 4 years?”, I hope that even non-Trekkies will see the value of watching this short scene called “The Perfect Moment” from the STAR TREK: INSURRECTION film in which Capt. Picard learns the amazing benefit of being present and fully awake. I realized that I worked way too hard in 2011. While I was able to revamp my website, grow my private yoga therapy practice, establish a series of well-received workshops and take on the extra responsibilities of leadership within the Naked Men’s Yoga SF community, by the time I got to my end-of-the-year retreat in Hawaii, I was exhausted and it took me quite some time to overcome feeling unmotivated and uninspired. Now, I realize that amount of self-disclosure coming from a yoga therapist might be taken the wrong way; but as I proceed into this leap year, I set an intention to realign my work ethic with my yoga ethics. It is such an honor to do the work I do, but I am taking my own advice – something I learned from the airlines – that indeed I need to “put on my own oxygen mask first.” That is what I am leaping towards: a better balance between serving others and taking care of myself. Things can fall apart, or threaten to, for many reasons, and then there's got to be a leap of faith. Ultimately, when you're at the edge, you have to go forward or backward; if you go forward, you have to jump together. Here I would like to invite you to come along with me on this interesting Journey, to mindfully take a leap into whatever will make your life more fulfilling, more rewarding, more satisfying. The world really needs you and me right now. And the more we nurture ourselves and those around us, the better the world will be. We can sit around and wait for the economy to turn around, or we can spend more quality time with one another. We can complain about how things are getting worse, or we can realize that by simply being kinder to one another we are adding to the positive energy of our whole community. We can let fear immobilize us or we can foster courage and take a leap of faith. All Muppets: [singing] Keep believing, keep pretending; we've done just what we've set out to do, thanks to the lovers, the dreamers and YOU! Are you with me? Are you? Well then, why are you still reading this blog? It’s time to LEAP forward and enjoy the day! It is also beautiful and dynamic metaphor for life. Similarly, partner yoga offers two people (i.e. friends, spouses, significant others, relatives) a safe, playful and supportive space to develop a practice of mutuality, respect, compassion and awareness of oneself and the other person. I thoroughly enjoy guiding two people in a yoga practice where each person gets to borrow the other person's physical and energetic bodies to support the deepening of their shared yogic experience. *Please note that this interview is in both Chinese and English. As I have worked with many inner city youth in the Bay Area, I often applied yoga tools such as pranayama (breathwork) and asana (poses) as a form of treatment of trauma and chronic stress. I was especially impressed by Dr Bessel van der Kolk, one of the worlds leading authorities on PTSD, and his evidence-based approach to treating persons with yoga. Please check out an interview of Dr. Bessel van der Kolk by clicking here. New Research shows the benefits of Meditation and Yoga...as if we didn't already know! Huffington Post's Wray Herbert writes about how meditation is good for mind, body, spirit AND our DNA!